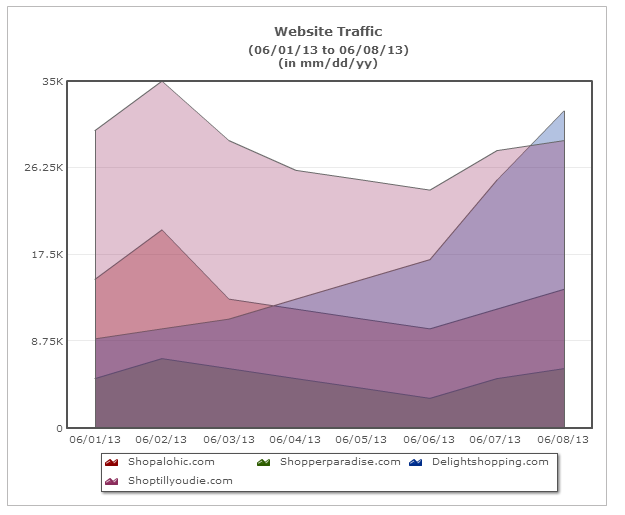 The Line and the Area chart look very similar. They even facilitate the same kind of analysis yet they cannot be used interchangeably. A line chart connects discrete but continuous data points by using straight line segments. 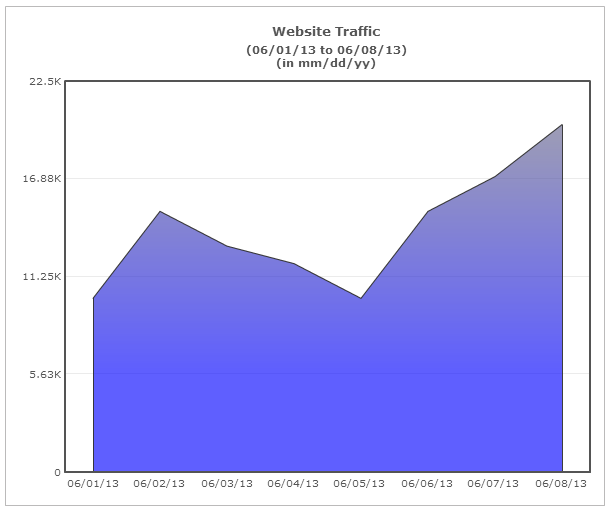 It is effective in facilitating trend analysis. 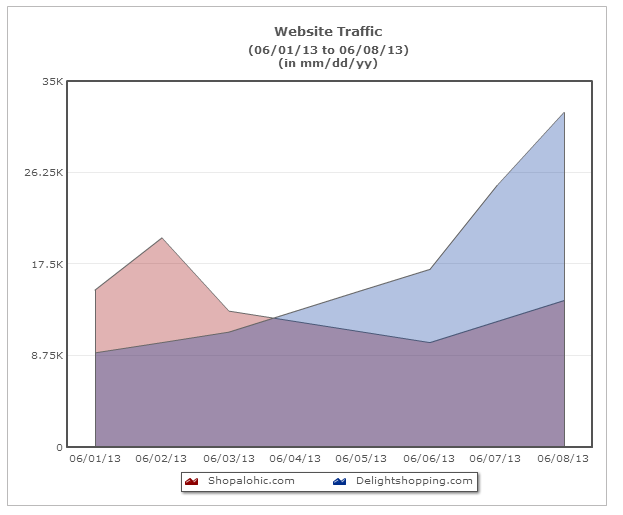 An area chart does the same except that the area below the plotted line is filled with color. 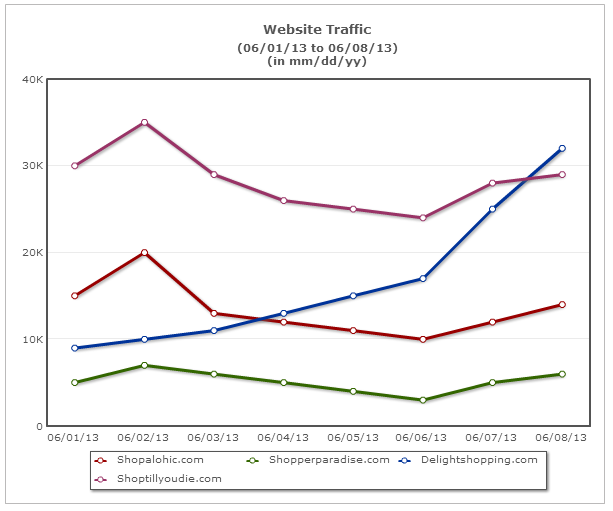 Line charts can easily be used to display multiple data sets. However, in Area charts, we cannot show multiple data sets clearly as the upper layer hides the layers below (occlusion). The problem of occlusion, can be minimized by increasing the transparency of the different layers but nonetheless it still persists. Increasing the transparency works best up to two data sets. 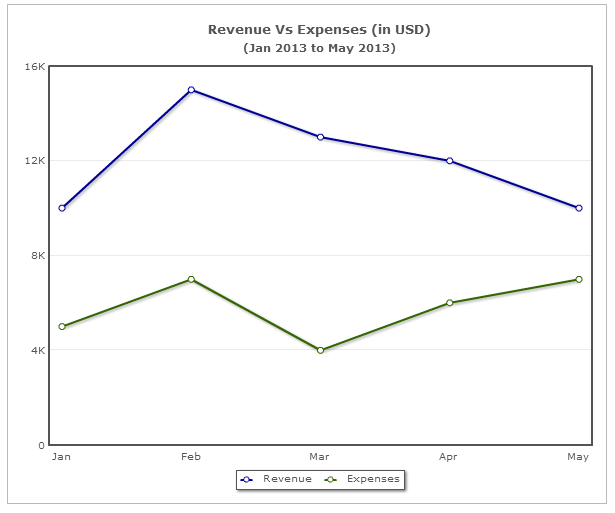 Let’s say you visualize your Revenue Vs Expenses data using an Area chart. 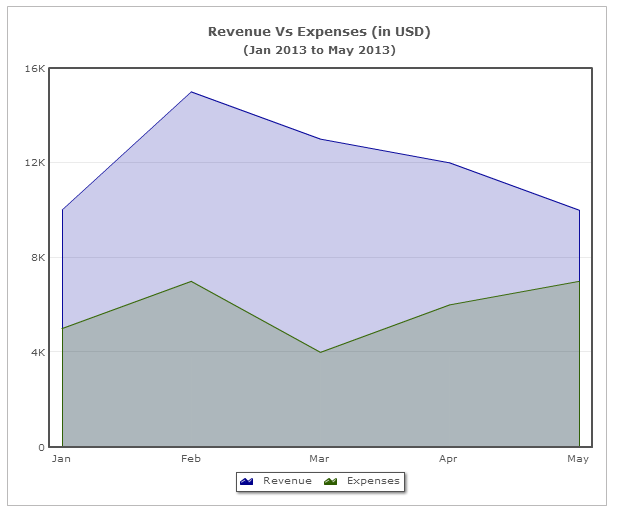 From this chart, we can get an approximate idea of the profits for the period by visually subtracting the expenses from the revenue. 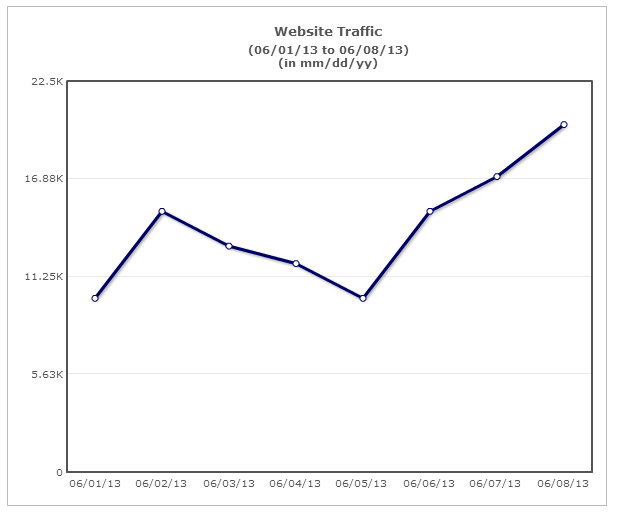 In a Line chart, there is no visual element (such as colored area) to support such cognitive relationships. Similar to a Stacked column chart, a Stacked area chart displays part-to-whole relations by showing the constituent parts of a whole one over the other. 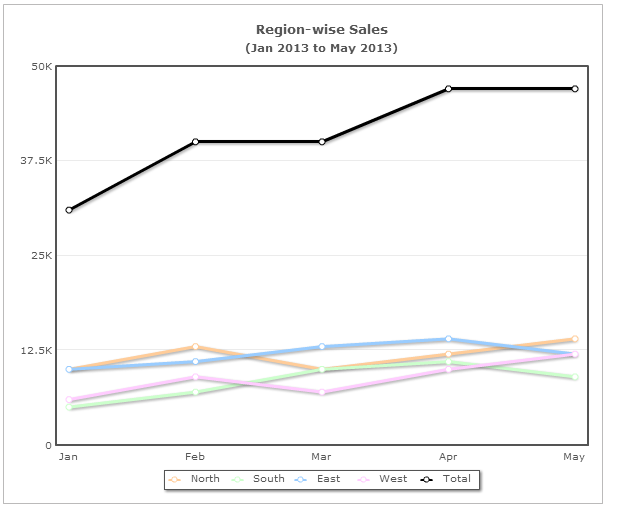 Let’s say you want to visualize your region-wise sales. 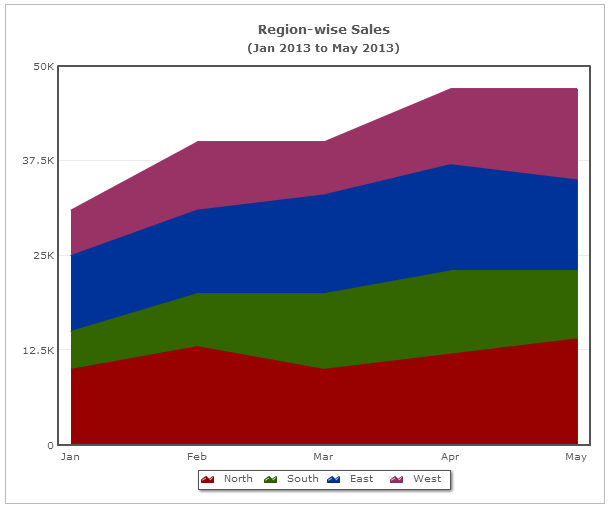 Using a Stacked area chart, you can not only get an idea of the total sales for a month but also the contribution of each region. It is however, difficult to interpret the area of each region precisely as the height of each region is affected by the pattern below it. 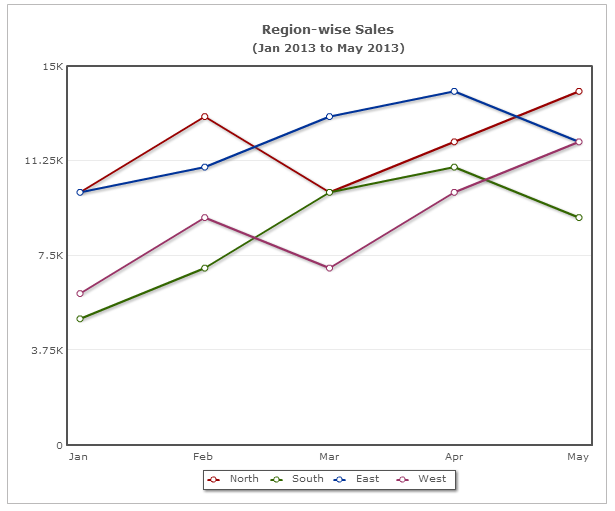 On the other hand, a Line chart is more effective in facilitating an understanding of the trend of your monthly region-wise sales. 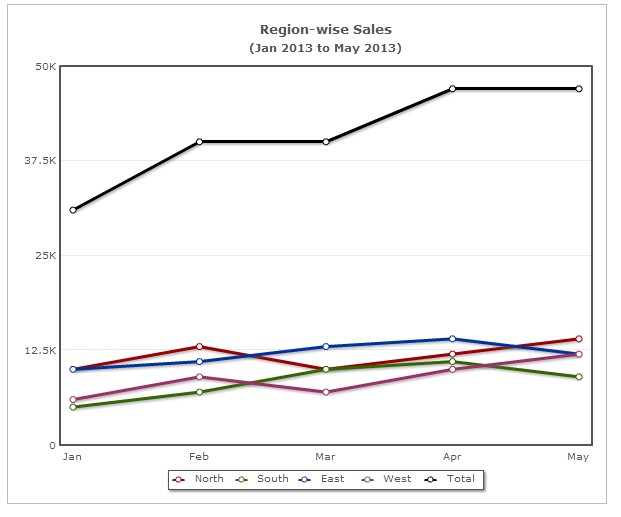 The trend for the total sales however, have to be obtained manually (by adding the monthly region-wise values and then plotting it as a separate line). A user in hurry may however, misinterpret the total sales line as another regional sales line, if he/she does not refer the chart legend. 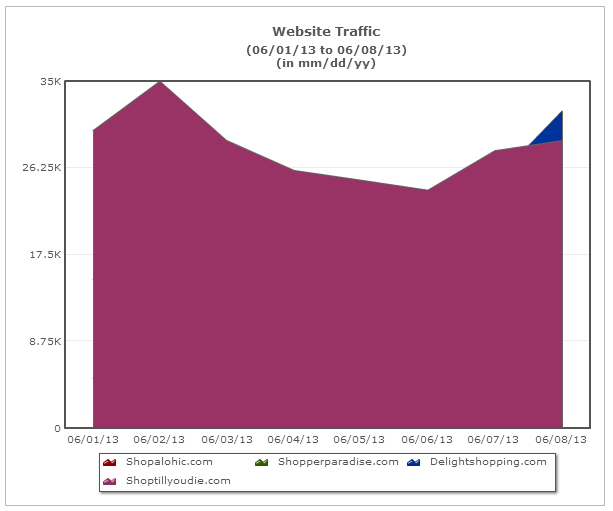 To avoid this, make your total sales line visually distinct from the regional sales lines. To sum up, while both the Line and the Area charts can be used to facilitate trend analysis, it is better to use the Area chart when there is a summation relationship between the data sets or when you want to show part-to-whole relationship (along with trend). Keep watching this space for more insights on charting best practices. This is a pretty good write!Thanks for this. Glad that you found it helpful.